William, my new brother, was entered into a contest to be on the cover of a magazine!! 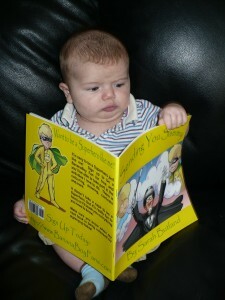 He was only two months old when this picture was taken of him already learning to read! I’m so very proud of him. In the previous post you saw Russ and me preparing to play with him; although he’s still too little to really play he’s growing bigger every day. Wouldn’t it be awesome to have a magazine with him on it? I’m so jealous. This entry was posted in Corona, Corona's Family and tagged Baby Stages, Brother William, Contest, Corona, Cover Of A Magazine, Dogo Argentino, Dogo Argentino Breed, Law Of Attraction, Russ, Sammy, Vote on April 12, 2010 by CoronaTheDogo.